There are many outposts of this old, famous bakery/restaurant around the Bay area. First time here - just next to Nordstrom at the Corte Madera mall. Lots of good choices, including seasonal and lower calorie options. Fast, efficient, tasty, reasonable. Soup salad combos are an excellent value not to mention how tasty! Love the bread bowls! I’ll go back for sure! Freshness and quality ingredients. Great atmosphere and kid friendly. 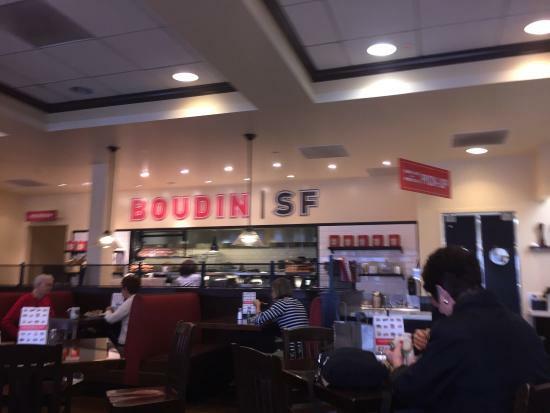 On every trip to California I find time to stop in at a Boudins. The one in the Village, Corte Madera is always convenient and provides quick service. The clam chowder bread bowls and chili bread bowls are always good. I love the salad choices here. They have new choices frequently and that makes it worth the visits. 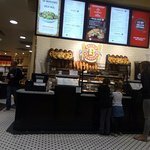 I also like their French bread and soups in the bread bowls. 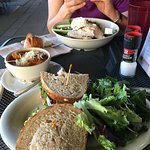 I have visited Boudin, Corte Madera many, many times and have always been impressed with their service and the quality of their food. Their salads are delicious and excellent value for the price. Great place to hang out and have lunch with friends. We tried the counter part, lots of people very few seats available. Food is taste but nothing to miss... next time we'll try upper floor (which by the way was a 45 minutes waiting). 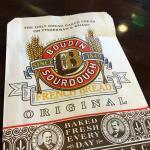 Get quick answers from Boudin SF staff and past visitors.